Perfect for restoring lost power or removing unwanted flood water, our selection of pumps and generators contains everything you need to get you back on your feet. You’ll find rugged and reliable machines that are capable of working in any environment. Lightweight for easy movement they are energy efficient and reliable in all weather conditions which makes them a great choice for winter. Loncin provides many choices of cost-effective general purpose clean water pumps. They are widely us..
Briggs & Stratton Sprint 2200 GeneratorIf you need a large amount of power this Sprint generator..
Loncin's generators are powerful, reliable and durable.First-class quality and minimal maintenance s..
Loncin s generators are powerful, reliable and durable.First-class quality and minimal maintenance s..
Loncins new generation of green, low-carbon power supply, with powerful loncin 148F engine. High eff..
Loncins generators are powerful, reliable and durable.First-class quality and minimal maintenance sa.. 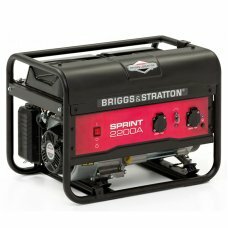 The Briggs & Stratton ProMax 7500EA 6000W/7.5kVA generator has been designed for premium perform..